Recently as a result of some homework from RMWB Leadership Bootcamp I created a little online survey and asked the public to anonymously evaluate how I am doing. I was very interested in the responses, and I will write about those in more detail at a later date. One of the responses that appeared again and again, though, was the encouragement to continue taking a stand. I was told repeatedly to not be afraid to voice my opinion, whatever it is, and to accept that while it may not please everyone that if it is true and genuine and authentic then it should be shared. And so today I choose to take a stand, and I do so on the banks of the Snye. I've followed the controversy regarding the Snye very closely. I've spoken to both sides, I've gone to an engagement session from the RMWB, I've perused the draft waterfront plan, and I have, in fact, gone down and walked along the Snye, gazing at it and back at the community around it. And I have come to my own opinion about what should happen in our downtown core, and why. I think the plan to revitalize our downtown, including the waterfront plan, is absolutely fundamentally crucial to our development. I do not want to see our community become nothing but suburbs, with a downtown that slowly withers and dies. I do not want to see our downtown become nothing but boarded up buildings, or drug deals on corners. I want to see it become a vibrant place where people work and live and play, and I think the plan to revitalize our downtown core does that. And I truly believe, to the core of my being, that it is essential if we are to avoid going down a very dark path as we experience exponential growth. As for the Snye, the main bone of contention - I think, perhaps, the time has come for there to be a quiet oasis of water in this city, a place free of motorized boats and float planes and snowmobiles. I fully understand the historic significance of the Snye, and that it has been used this way for decades. But the argument that it has been this way for decades simply isn't enough to convince me. Many things have existed or been done for decades, from apartheid to the Berlin Wall to the Cold War to washing dishes by hand - but that doesn't mean just because it was always that way it should remain that way. If that is truly the way we think we would never move to a new house simply because we've lived in the old one for decades, and most of us would never leave home, change jobs, or have children. Change is what we DO because we are human, and we change - and so do our communities. In the draft waterfront plan there is accommodation being made for float planes and motorized watercraft, just not on the Snye itself. And I'm okay with that, as I am okay with a small spot of water in the middle of this community where the only sounds heard are laughter and birds, not motor boats and float planes. I will be delighted to see the float planes take off at their new moorings, and to see boats depart for adventures from their new launch. It just might not be on the Snye itself. I have been deeply troubled by certain aspects of the Snye debate. I have been dismayed by people having their opinions dismissed simply because they didn't grow up here, or haven't lived here "long enough" (although I don't know who gets to determine what "long enough" is - five years, ten years, twenty years, a lifetime?). I have been dismayed that it has been portrayed as a battle between old and new, past and present, progress and status quo, when it is NONE of those things. It is, simply, a difference of opinions, and one that should be open to dialogue, not divisiveness. It should not be a situation where attacks are the norm, although I expect I may be attacked for having the audacity to voice my opinion publicly. I was called a "PR pansy" recently (although I think they *might* have meant "patsy") and I was saddened simply because it showed how little they know about me and what I do, as I write this blog entirely for free, have devoted over a year of my life to it, and the opinions in it are nothing but my own, endorsed and paid for by no one. I promise you that anyone who voiced their opinion to me was not judged or dismissed - it just may be that I don't agree with you, but it doesn't mean I disrespect your opinion or your right to hold it, and I would hope you can grant me the same courtesy. Here's the thing, though. If you think I am wrong you can voice your opinion, too. 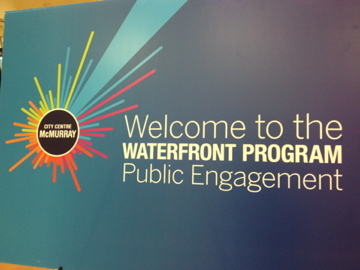 There is one last public engagement session on the waterfront draft plan, and it takes place this Saturday. You can go and speak to the folks from the RMWB like I have, you can make suggestions, and you can voice your opinion. You can go right here to view the draft waterfront plan and access the online questionnaire. I have my opinion, and I have now shared it openly. You have yours, and you can share it, too. All I ask, in the end, is that we don't allow a difference of opinion and rhetoric to divide us as a community when that is the last thing anyone of us want or need. In the end I would like to see us all standing on the banks of the Snye together, regardless of what it looks like when all is said and done. as we are all in this together. I was born ans raised here and have been around planes my whole life. The usage of float planes at the snye has decreased and most aircraft now are on amphibs (meaning they can land on both land and water). I remember playing in the water at the Snye while my mom was at the old Voyage Air Hanger and while I was walking in the water I stepped on either broken piece glass or a piece of a boat launch (keep in mind I was 8 and I am now 25 so I don't quite remember what it was) regardless all I remember was that I was left with a huge gash on my foot and was bleeding a lot. My point of this story is that I would love to have a place in town to take my future kids to and let them play/walk in the water with their remote controlled boats, or take my dog for a walk along the Snye and not have to worry that they might cut their foot along the waterfront. Why are we "preserving" something because of it's heritage, when it can become so much more for future generations that they can then make it apart of there heritage? Both the Boats and float planes will be based out of a different area on the Clearwater, which is already outlined in the waterfront plans. I agree with the waterfront development plans. Instead of having unused hangers and a closed mini golf take up valuable space develop it. lets turn the snye into something beautiful for everyone to use.